investigates the differences between criminals and the rest of society, and the differences and similarities between and among criminals. Chock-full of personal anecdotes, this engaging text is unique in that it combines the experience of Doug Bernstein, a clinical psychologist and a successful textbook author, and Elaine Cassel, a practicing attorney who regularly teaches psychology and law. Organized around five dimensions related to the causes, characteristics, and consequences of crime, the book summarizes the programs that research suggest offer the best hope for doing a better job of dealing with crime in the 21st century. The authors argue that prevention is the key to dealing with crime, and present comprehensive suggestions for crime prevention. The new edition features the latest criminal statistics available, as well as the most current research on the causes and correlations of crime and violence. Other highlights include: discussion of the latest brain-imaging research in psychopathy - how psychopaths' brains are different from "normal" brains; the latest on gang activities and how their venues have migrated to suburban and rural areas; terrorism and its roots; Internet crimes, especially sexual predator crimes; the latest research on how media violence, especially violent interactive video games, contributes to criminal behavior; the examination of drug and mental health courts as alternatives to punishment; and recent Supreme Court rulings eliminating the death penalty for juveniles and the mentally retarded. 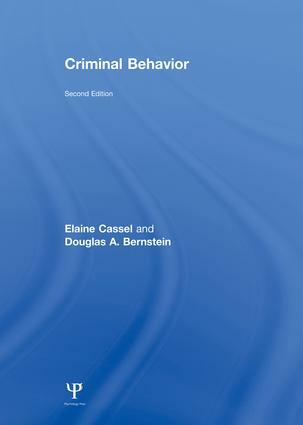 Intended as a textbook for upper-level courses on criminal behavior, psychology and law, and developmental psychopathology taught in departments of psychology, criminology, criminal justice, law, and sociology and/or criminal justice training academies. Contents: Preface. What Is Crime? The Criminal Justice System. The Juvenile Justice System. Biological Roots of Crime. Psychological Roots of Crime. Social and Environmental Roots of Crime. The Development of Crime From Early Childhood to Adolescence. The Development of Crime From Adolescence to Adulthood. Mental Disorders and Crime. Violent Crimes. Economic and Property Crimes. Victims of Crime. The Punishment of Crime, and the Crime of Punishment. The Future of Crime.